Bibliophiles in Europe at the end of the nineteenth century began to take a serious interest in the manuscripts of the Middle East and the paper on which they were written. Perhaps the most important of these men were C.-M. Briquet working in Geneva, and J. Wiesner and J. von Karabacek working in Vienna. All three were concerned with the burning topic of the moment: Was oriental paper made of cotton? Within the space of two years these three writers published seminal articles for the European study of Arab paper. 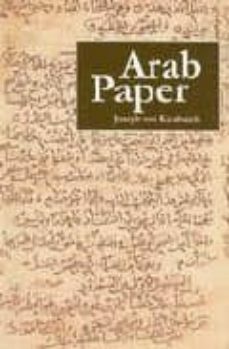 Das Arabische Papier is one of those articles. The late Don Baker's inspiration to set about the translation and interpretation of this work was 'simply the desire to know the contents of this much quoted article'. Students, historians, curators, collectors, conservators and all those interested in the historical development and spread of papermaking will realise why Don Baker wished to make this important text available to English readers. This Archetype edition is a revised edition of the volume, which Don Baker produced in 1991.